Bangkok: Today (27 March) APSA attended the “Thai – Dutch Seed Innovation” seminar and forum at the Bulan Phitak Phon room of the Institute of Food Research and Product Development building, Kasetsart university, Bangkok. 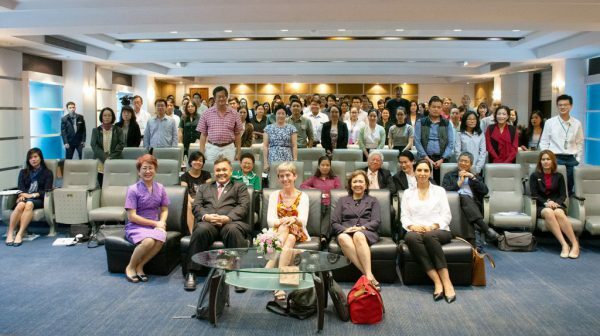 The event was organized by Kasetsart University Research and Development Institute (KURDI), Embassy of the Kingdom of Netherlands in Bangkok and National Science and Technology Development Agency (NSTDA). In the forum’s first session, Dr. Coosje Hoogendoorn presented “How the Netherlands Becomes Global Seed Innovation Leader; Lesson Learned” which provided invaluable examples and insights in context Thailand’s own budding seed industry. The second session, “The Dutch Seed Business in Southeast Asia: Opportunities and Challenges” was presented by APSA Past President, Dr. Mary Ann Sayoc, who is Public Affairs Lead of East-West Seed Group. Her presentation provided sound advice and examples of productive and synergetic collaboration between the private sector, educational institutions and and smallholder farmers. FRONT ROW: Asst. Prof. Warapa Mahakarnchanakul, Director of KURDI, Dr. Chongrak Wacharinrat, Acting President of KU, Dr. Coosje Hoogendoorn, Access to Seed Index, Dr. Mary Ann Sayoc, East-West Seed and Ms. Kenza Tarqaat, Deputy Head of Economic and Political Department of the Netherlands Embassy.